Looking for a unique unicorn mask, for magical costume party? Meet Jean-Clod. A unique unicorn. Jean-Clod unicorn is a fun-loving guy who desperately wants to be cool. He loves the ladies, and the ladies mostly think he's okay. Jean-Clod is known to grant wishes, but those wishes come true in strange or unexpected ways. He is most suitable for an adult. This mask is lightweight, and has an adjustable set of double straps at the back for a precise and comfortable fit. The mask is lined with eco-felt, made from mostly plastic bags, and Jean-Clod has a very good quality faux-fur forelock. Make Jean-Claud's dreams come true, and invite him to your next party. you will have fun, he will have fun, and no one will be disappointed. Play Jean-Clod and have some fun goofing around. This mask looks great in photo-shoots, and mischievous peeking out from around a corner. You can be the life of the party in this silly mask. The mask is so comfortable you will hardly know you're wearing it. Awesome. This mask is more suitable for an adult, but your call. The base is lightweight papier maché, made from recycled paper. The inside lining is a piece of black eco-felt, a type of felt made from recycled plastic bags. The straps are super sturdy one inch wide cotton. The extra width helps keep the mask firmly in place. I will do some customization for free if you want something changed a little. I have decades of experience making masks, costumes and puppets, and my work has been featured in lots of newspaper and magazine articles. I've created artworks large and small, in Alaska, Europe and Asia. What am I most proud of? People love my work! I get great reviews. What people say they love most is the comfort and the customer service. I really go the extra mile to make sure you LOVE your mask. Thanks for visiting my page! 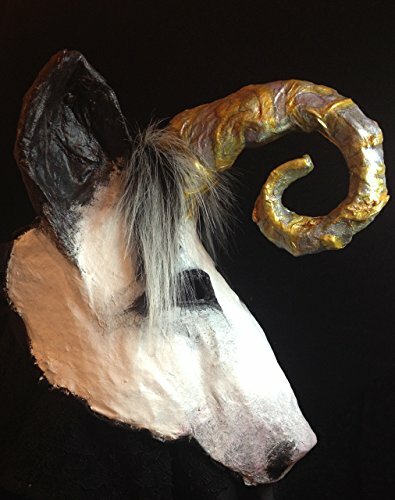 Satyr masks, horned masquerade costume headpieces. For Festival, masquerade party, photoshoots, pranks, cosplay, larp, or Beltane. Adjustable adult, god pan, wine god Bacchus, paper mache masks.